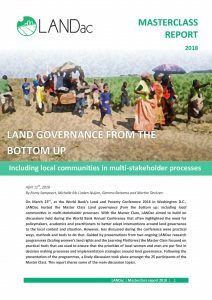 On March 23rd 2018, at the World Bank’s Land and Poverty Conference 2018 in Washington D.C., LANDac hosted the Master Class Land governance from the bottom up: including local communities in multi-stakeholder processes. With the Master Class, LANDac aimed to build on discussions held during the World Bank Annual Conference that often highlighted the need for policymakers, academics and practitioners to better adapt interventions around land governance to the local context and situation. However, less discussed during the conference were practical ways, methods and tools to do that. Guided by presentations from two ongoing LANDac research programmes (Scaling women’s land rights and the Learning Platforms) the Master Class focused on practical tools that are used to ensure that the priorities of local women and men are put first in decision making processes and implementation strategies around land governance. Following the presentation of the programmes, a lively discussion took place amongst the 25 participants of the Master Class. This report shares the main discussion topics.